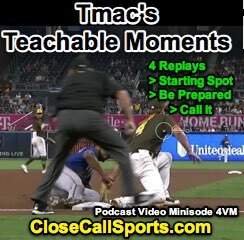 This edition of Tmac's Teachable Moments is an audio commentary with video of four Replay Review plays that occurred in MLB. 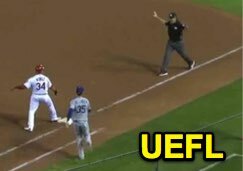 First, we see Ben May patiently time an out call on a caught stealing at second base, then 1B Umpire Carlos Torres makes sure a fly ball is caught, James Hoye officiates a banger at first, and Chris Conroy anticipates a potential play at third base and is in great position to rule on a no-look tag attempt. Podcast Video Minisode 4VM is a Teachable. Introducing Audio Commentary: The following Teachable is available in audio form via this post and also via our RSS setup for The Plate Meeting Podcast. This episode is a Video Minisode and is labeled Episode 4VM. 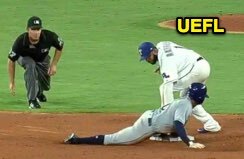 Play 1: Our first play features 2B Umpire Ben May officiating a tag play during a stolen base attempt in Texas. Our runner, wearing the protective sliding "oven mitt" over his hand, appears to slide headfirst directly into the fielder's foot, which is guarding the base. Sidebar: Because the fielder has the ball, there is no "obstruction" conversation to be had. Watch May wait to make a call as he gets himself a good look as to whether the runner was able to reach the base ahead of the tag. After running the play through and confirming what he has seen, May signals the out, which is affirmed via Replay Review. Carlos Torres observes a catch in Houston. Play 2: Next up is 1B Umpire Carlos Torres on a line drive to right field, caught by our Diamondbacks right fielder in Houston during a tumbling head-over-heels catch that takes his glove to all sides, meaning that 2B Umpire Mark Carlson may potentially need to help out as the glove and bare hand holding onto the baseball rotated out of Torres' sight. Like May in Arlington, Torres in Houston waits to make a call, appears to take a quick look at his crewmate to make sure the ball hasn't fallen out, and finally comes up with the out. 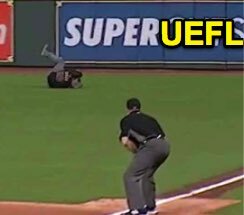 This call is confirmed on review thanks in great part to the multiple replay angles that allow us to see that the fielder possessed the ball the entire time, and that it did not hit the grass. On the field, we're only allowed one angle in realtime, and potentially—by visually communicating with a crewmate—an additional angle that can help settle the call. James Hoye signals safe on the play at first. Play 3: 1B Umpire James Hoye has to officiate three aspects of a play within a matter of three tenths of a second. First, he has a fair/foul decision on a batted ball, then he has a catch/no catch consideration, and finally (the most challenging call), he has to determine whether the runner made it back to first base before being put out by the fielder's tag attempt on what we call a "reverse force" play in our replay shorthand. The play explodes in close quarters at first base and with so many things happening at once, it's important to see the big picture. The most important call here will be the safe/out on the tag attempt, and it is vital to stay engaged throughout the play by anticipating the tag issue before it happens. Hoye does this here, is able to exclude the mitt laces from consideration of out/safe, and comes up with a quick safe call that is affirmed after review. Chris Conroy moves to see the tag play. Play 4: Finally, 3B Umpire Chris Conroy in San Diego prepares for a potential play at third base on an infield grounder up the right foul line. With a runner at second, we know there is no force play at third, such that the fielder will have to tag the runner if the defense does decide to try for the out at third base. That's precisely what happens, and Conroy moves into position, looking for the keyhole angle that best serves him in being able to see the important aspect of the play: did the runner get to third base and did the fielder tag the runner? This anticipation and preparedness ahead of the play allows Conroy and the other umpires to best position themselves for these close plays, and to time their calls just right so as to support the highest level of accuracy. Ben May (Play 1) stays with the tag at second. In Conclusion, it all starts with your starting position. Where will you want to be at the crack of the bat—or a potential pickoff play—and where will you need to go on a mile-a-minute play like Hoye's in St. Louis? Second, be prepared for anything. 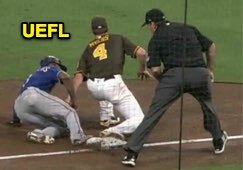 If you're the third base umpire and there's a runner on second, be like Conroy and assume the next play will be at third base, even if that probability is realistically low...it still could happen, just like it did in San Diego. Finally, call what you see after you make darn well sure of what it is that you did see. Whether that means waiting to replay the sequence before coming up with a confident call like May or taking a quick peek at your partner like Torres, make sure of what you have and practice good timing when making your call. Until next time, Happy Umpiring, Everyone!